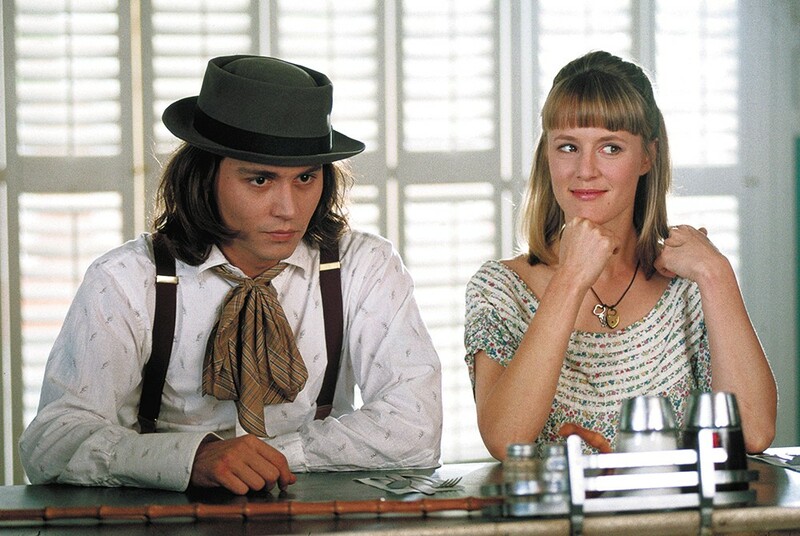 Johnny Depp as Sam, and Mary Stuart Masterson as Joon. It's a cliche to suggest that a film's location is practically another character, but you could argue that's the case with the Spokane backdrops of the 1993 romantic comedy Benny & Joon. Shot in the summer of '92, it's the story of a brother and sister, orphaned as children, struggling to live together under the same roof. Benny (Aidan Quinn) is a soft-spoken auto mechanic; Joon (Mary Stuart Masterson) is an artist prone to manic episodes. Enter Sam (Johnny Depp), an eccentric modeled after silent-screen icon Buster Keaton, who ends up moving in with Benny and Joon and becomes an unlikely mediator. Benny & Joon was directed by Jeremiah Chechik, and it was his second feature following 1989's National Lampoon's Christmas Vacation. Both films followed similar trajectories: They were respectable but minor hits upon initial release, and have since developed into beloved cultural mainstays. INLANDER: What brought you to the project in the first place? CHECHIK: It was sent to me by the producers, and we set it up at MGM with Alan Ladd Jr. It's very hard to make those kinds of movies today, and even then, as a studio movie, it wasn't exactly in their wheelhouse. But we convinced them we could do it for a price, and off we went. The original script was quite different. It was similar in structure, but the characters were different. Benny was a fast-talking loudmouth, and his brother wanted to get him into show biz. It was an L.A.-based story, and we redeveloped it for the more everyman character Aidan would eventually play. And Johnny would kind of envelop — and this is what I wanted to do — a quieter, more mysterious character. Would you say, then, that Depp was the tuning fork that the rest of the movie was set to? I don't want to oversimplify it, but in many ways, the quirkiness and specific commitment of Johnny to that character certainly allowed a broader framing device of the same kind of offbeat quirkiness in the overall tone. So I guess the short answer to your question is yes. The movie also has an impressive roster of supporting actors — William H. Macy, Julianne Moore, Oliver Platt, CCH Pounder — and some of them before they were much more famous. Julianne auditioned, and I think she'd only made one or two movies before. She was just so great. Macy I kind of knew, so I got him in. And Ollie — I forget. He's a friend of mine, and I think I just offered it to him. I try to get my team as cogent as possible and as talented as possible to make me look good. Well, you got a great cast, so it does reflect back on you a little bit. I find it fascinating that this began as an L.A. story. Can you explain how Spokane became the primary shooting location? I never intended to make an L.A. story, so we quickly moved off that and into a much more middle-class town. So we were very open as to where it could be shot. We really explored a lot of the Pacific Northwest; I felt that was the right kind of vibe for it. It's actually a funny story how we ended up in Spokane. We looked at Seattle and Tacoma. In fact, Tacoma really attracted me; it had the right kind of tone for the film. We had received a huge pile of photographs from the Washington Film Commission, and there was a loose photo of a house under this bridge, and it just kind of slipped out of this file folder. There weren't any real markings on it or an address. And I remember turning to Bill [Badalato], who was the line producer, and saying, "This is it. This is their house! We must find where this is." So everyone put their eyeballs to the photo and we started to ask around, and we identified where the bridge was. ... So off we went to Spokane, and we started to ask everyone around. There were no scouts; it was just Bill and myself driving around, and eventually we found the house. We pulled up in front and I went up and knocked on the door, and it was better than I had ever imagined. I think it was a lady who answered, and I said, "Hello, you don't know us, but we want to use your house for a movie." And lo and behold, they agreed. As soon as I saw that house, it inspired me to really find the locations that matched it. It just had exactly the right tone. But I still remember going up to that house like it was yesterday. Did you know the current owners have turned that into an Airbnb and advertise it as the Benny & Joon house? [laughs] Wow! I did not know that. And we built [Joon's art] studio in the back. That was a construct. The locations you picked, like Peaceful Valley and Mary Lou's Milk Bottle, have a built-in quirkiness to them. Do you think that contributed to the movie's tone? Yes, absolutely. The sense of place is extremely important in that particular film. ... There's a warmth, I think, to all the locations we chose. I can't over-intellectualize it, because often one selects locations with one's personal tastes, instinctively, [or] because they're practical. I think that everyone who made that movie bonded over our experiences there. You wouldn't describe Spokane as a hotbed of night culture, but that really helped us. At the end of the day — we'd shoot 12 or 13 hours, and we built a little music studio on the stage — so we would order in food and we'd play music. On the weekends, we'd have rotating parties for each other. We built our own community, and I think if we were in a city with a lot more distractions, it'd be more difficult to build that camaraderie and really bond. The city itself really did affect and inform not only the story, but the way the story was told and the feeling we all had when we were there. ... We would sit shooting nights on that block, and neighbors would sit in their chairs and watch and bring us food. It was a very warm, great environment to make the movie. Are you surprised that people are still connecting with this movie, and that it still has a life all these years later? With Benny & Joon, we definitely wanted to make something that would last, that was a universal fable in many ways. The fact that, years later, people are still watching it, commenting on it and enjoying it is heartening, because that was our intention, though it doesn't always succeed in that way. Not all cities the size of Spokane have an annual film festival. Even fewer have film festivals that have been an institution for two decades. The Spokane International Film Festival, now entering its 20th year, is the event that local cinephiles always look forward to, a bit of welcome counter-programming to Oscar season bombast. The fest was founded as the Spokane Northwest International Film Festival (or, amusingly, SNIFF) in 1998 by late film critic Bob Glatzer, and it's grown exponentially since then, bringing pieces of the rest of the world to the Inland Northwest every February. I first attended SpIFF back in 2005, when I saw exceptional films from places I didn't even know made movies — Slovenia, Bosnia, Tajikistan — and I've been back every year since. 2018's roster no doubt contains buried gems, too: There are animated features about women in the Middle East; documentaries with subjects like modern dance, immigration and bomb disposal units; an underdog sports film from Estonia; and a low-budget sci-fi movie involving weird cults and monsters. If that's not variety, I don't know what is. The original print version of this article was headlined "When Hollywood Found Spokane"